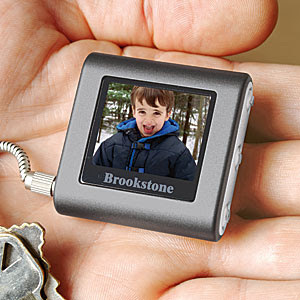 This keychain by Brookstone will allow you to download your pictures from your PC or Mac and take them with you. It holds up to 56 images, making it a mini digital photo album. When you carry one of our digital photo keychains, you can leave the bulky photo album and the expensive digital camera at home … and still have your favorite and most cherished photographs handy. Your keychain picture viewer fits easily in your pocket or purse. This keychain picture viewer is a snap to use. Photo keychains automatically resize photos to fit the screens. The 1.4” computerized LCD screen displays clear, vivid photos. Screen resolution is 108 x 80. 8 MB of internal flash memory holds up to 56 color images. Software included for drag-and-drop transfers to picture keychains. Includes built-in, rechargeable battery that provides 2.5 hours of viewing time. I can honestly say, I love this thing!! Gramma’s…you will be getting one of these for Mother’s Day! !